Discussion in 'Property Tours' started by Native Hunter, Mar 13, 2019. Wow, that's one heck of a shoot house! Looking forward to another property thread! Steve, I think I'd call that casa grande..."Solitude Lodge". This gonna be fun to follow. Thanks weekender21 and Triple C. So glad you guys will be tagging along. 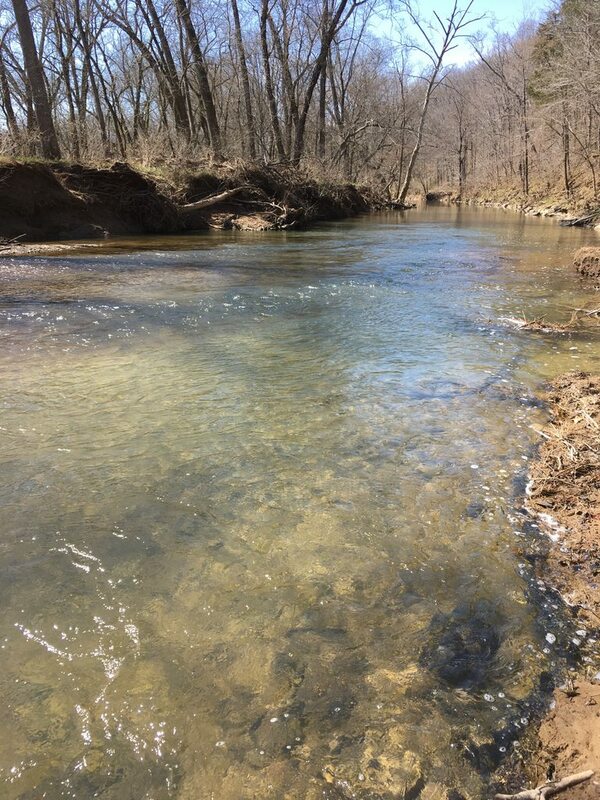 I really think I will spend more time hunting at my other place, but this will definitely be a great place to get away from the rat race and spend some quality outdoor time. I might even do a little creek fishing. It's been a lot of years since I did that. 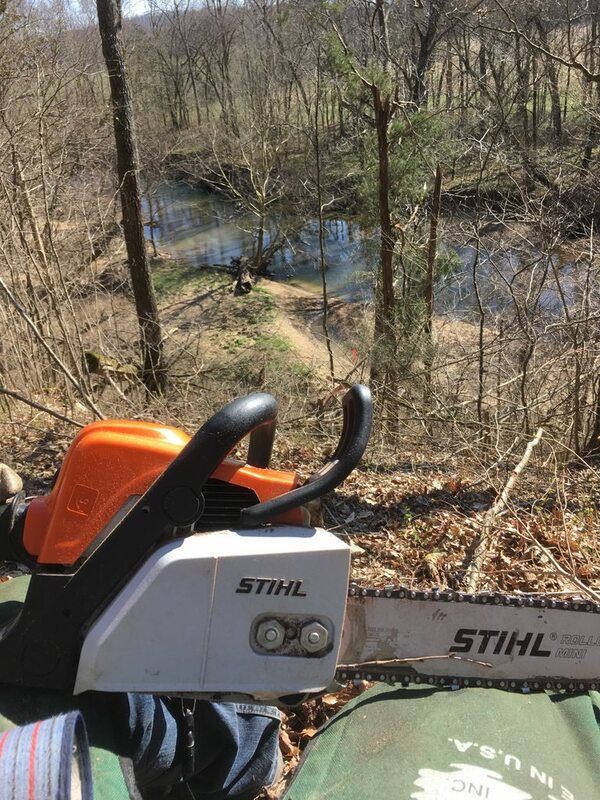 Wow you are becoming the Jeremiah Johnson of Kentuck, Geo has moved into the Deliverance holler, an Lakn is revamping his 100 yo property into a hunting Mecca, Chainsaw has reworked the western part of his state. All making my feeble mountain complex look like downtown New York suburb instead of an isolated hillside. I like what you guys are doing. Fun to follow. Chainsaw, Mennoniteman and Native Hunter like this. 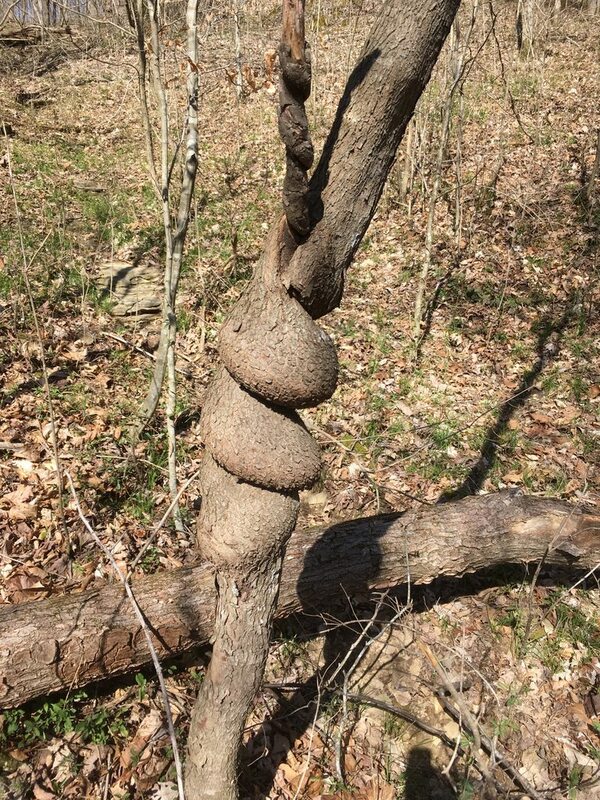 Wow you are becoming the Jeremiah Johnson of Kentuck, Geo has moved into the Deliverance holler, an Lakn is revamping his 100 yo property into a hunting Mecca, Chainsaw has reworked the eastern part of his state. All making my feeble mountain complex look like downtown New York suburb instead of an isolated hillside. I like what you guys are doing. Fun to follow. Yep, lots of excitement going on here these days. I don't think you are quite a New York suburb yet old mountain man. We are all counting on you to keep us all in line and headed the right direction. Steve...I'm changing my mind on "Solitary Lodge". Sounds like you'd be confined. I'm leaning toward "Serenity Lodge". I forgot to mention that Weekender is leveling 3000 ft mountains to make food plots in the ongoing major management operations. Name of you place? Dark Side of the Moon-shine. That should be appropriate - looking down over at that serene creek below! I think TC nailed the name. We better not talk too much about moonshine or the revenuers will be after me...…..
Below is a picture of the design I'm doing for this property. The yellow lines are shooting lanes from the tower blind. Use the numbers below to learn more about each feature. 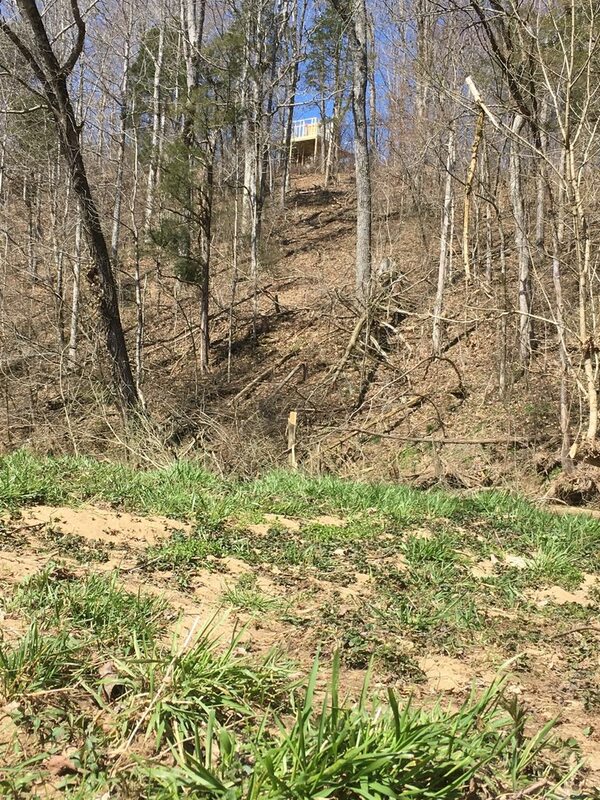 #1 - This is the shooting lane that ends at the top of the bluff. A well established east / west trail crosses the lane here. #2 - I have discovered a spring coming out of the hillside here. This shooting lane ends at that spring. I will develop this into a small pond. If it isn't too rocky, I will dig it by hand but will hire a backhoe if necessary. #3 - The is a heavily used creek crossing on the west side. There is good bedding and cover up the hillside from here and the deer move from here up into the #8 shooting lane. #4 - This is a shooting lane to a big gravel bar on the creek. I don't expect to shoot a deer here but might. This will be the water view for that peaceful easy feeling. #5 - This is a well used entry point to the woods from deer coming across the middle of the field from the cedar thicket to the north. This is a long shooting lane and they will also use this lane for travel. #6 - This is a random lane where I have already put a mineral lick. #7 - This lane is on the ridgeline coming up from the creek at the crossing on the east end. The lane is looking down a well established trail. #8 - This lane is on the ridgeline coming up from the creek at the crossing on the west end. This lane is also looking down a well established trail. Looks like a big buck killin' destination for sure. Winds are normally from the south and southwest, right? That is correct Ben. And sometimes from the north in winter. The tax man will be after you also judging by the size of that lodge, but you can recoup the money by having a bed&breakfast. Serenity B&B. Are you thinking this is strictly a rifle spot? About what distances are the shooting lanes? It is more of a rifle spot, but there should be good opportunities for bow and crossbow as well. You could make good bow shots in all directions. I don't have a precise measurement yet, but I know that we will be able to see over 300 yards out into the bean fields too. I'm a big bowhunter but I also enjoy long range rifle hunting just as much, each has a season. 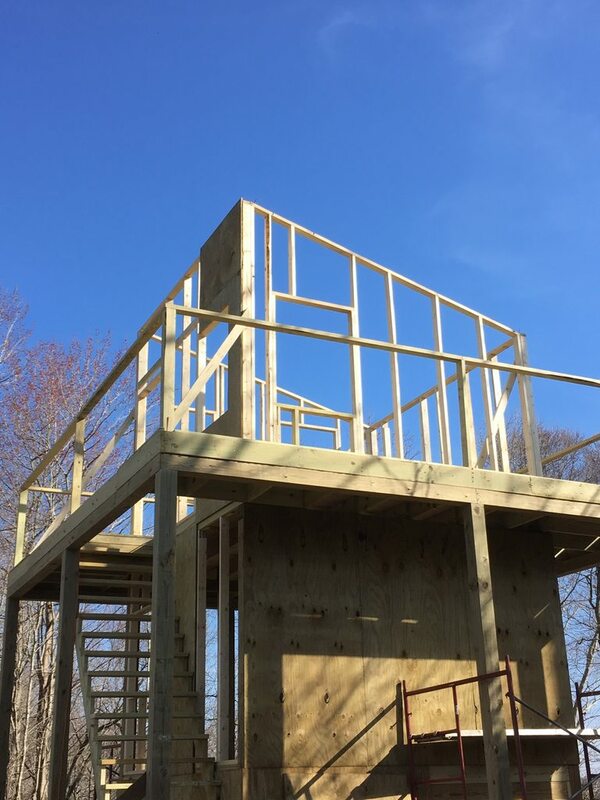 Would you agree that the bigger the size of structure, the further the deer will stay away from it though, especially if it's closed at ground level? Or would you say that's not a factor? I'm thinking, will the deer move within 20-30 yards of your new stand there. I gauge my answer by what I see at my other farm. I have several old buildings there. 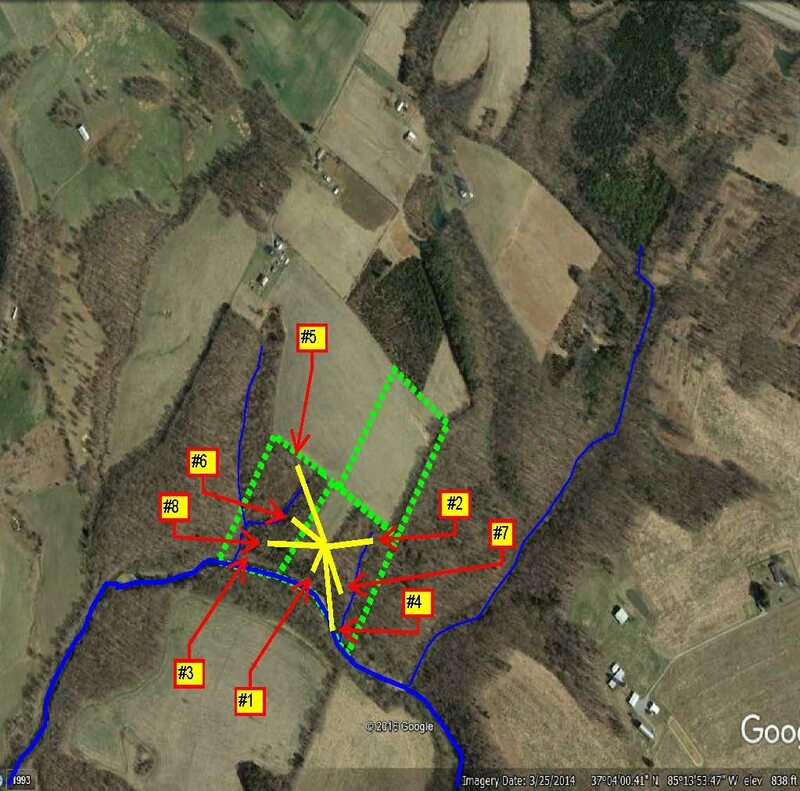 There is a really big barn that is closed in at the bottom, and deer will commonly walk within 10 feet of it. The other buildings are the same way. I think it is all about human scent. If you spend a lot of time in those buildings, they will associate them with humans. However, if they don't smell people, they look at them just like a land feature. I think there will be no problem with deer moving within 20 yards of this blind, because I will only be in it when hunting and will take great care to hunt it wisely - taking wind into consideration. I think this could be an incredible bow hunting spot - especially early in the season when bucks start shifting to their fall and winter ranges. Those #1 and #7 lanes should be the hot spots. Both of them will have places where shots are less than 40 yards, and I would expect 20 yard shots in the edge of the field. I was back at it today and finally finished all of the shooting lanes. I had been putting off the tough one until last, but I finally jumped on it. 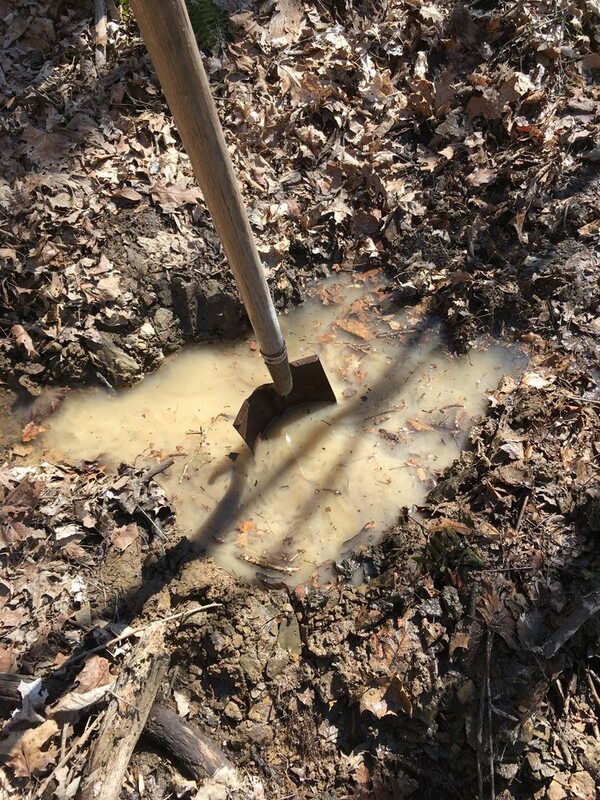 Also did a little shovel work at the spring I found. There is a lot of water coming out of it high on the ridge. When I was on the creek bank a few days ago, it was following the heavy rains and high waters. 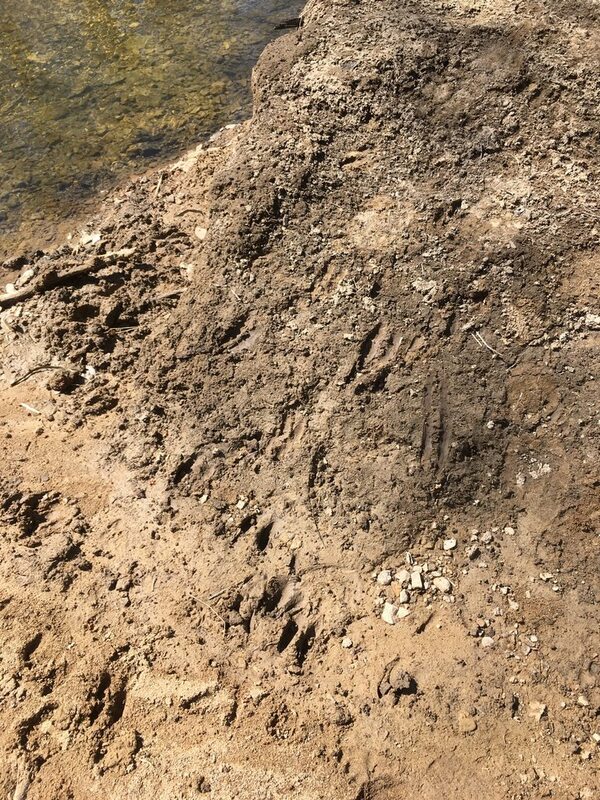 All the tracks along the banks had been washed out. In one week they have tracked it up again. 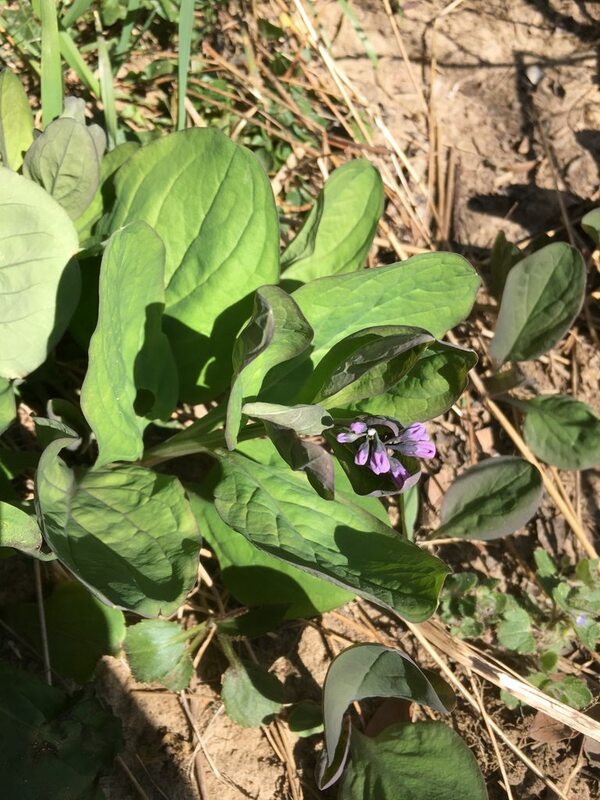 These Blue Bells are ready to pop soon. The creek banks are covered with wildflowers. Things are starting to take shape. Chipdasqrrl, Gator and Cedar Ridge like this. Heck of a week in the woods! Looks like a few small mouth might put up a fight in that creek! Only Native could make a shooting lane sketch look like an alien landing. Impressive NH, impressive. Chipdasqrrl and Native Hunter like this.